One of the first softies I ever made was a fleece bunny and carrot from a kit my mom sent me in a care package when I was in my early 20’s and living on my own. My mom is a big buyer of kits. I made the bunny and it was the first softie I’d made since summer camp when I was 9. In that same package was a kit for a knit hand puppet. Even though I have pretty shabby knittng skills, I made that one, too. Kits are a great way to try something new. 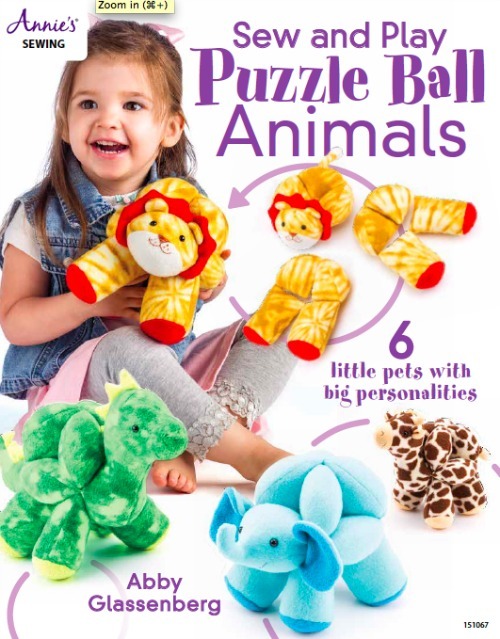 An expert puts together a package with a pattern, instructions, and all the materials you’ll need and you get to have all the fun. Pull it out on a weekend morning or a workday evening and spend an hour or two creating without pressure. Because kits are all-in-one they make great gifts, too. I love to sew softies, but I know that sewing a softie is new for lots of people. A kit might be a way to get your feet wet without having to invest in tons of new materials or tools. 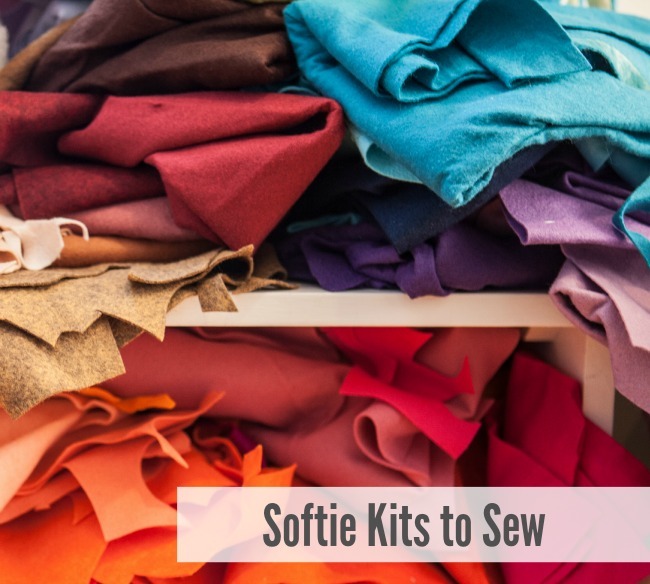 I’ve put together a round-up of some softie-making kits. I haven’t sewn any of these, but they all get good reviews and/or are created by makers that I know and trust. If you’ve tried one of these, or know of another softie sewing kit that you’d recommend, please chime in! 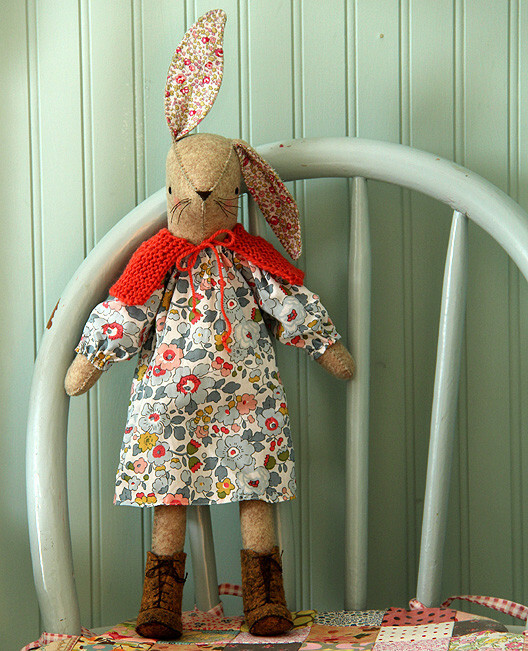 First up is Miss Maggie Rabbit, a kit created by Alicia Paulson of Posie Gets Cosy. 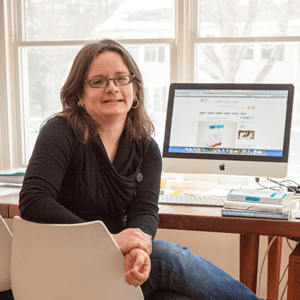 Alicia has a wonderful blog which she started the same year I did, back in 2005. Her posts are like pieces of candy: sweet, wonderful treats. She takes gorgeous photos of her life and her daughter and writes in a purely honest and heartfelt way. 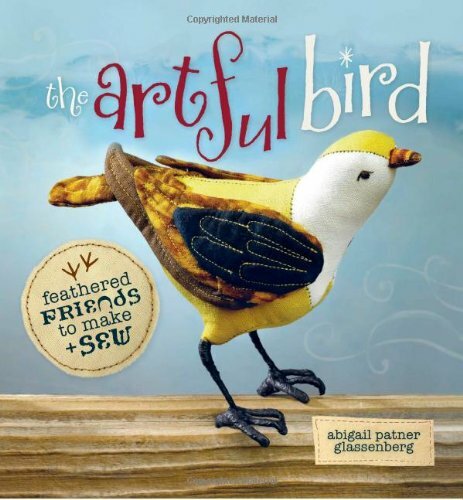 She’s the author of Stitched in Time and Embroidery Companion. Miss Maggie Rabbit is like a storybook character come to life. Look at the lace-up boots! She’s 18″ tall. The kit comes with felt from National Nonwovens and some Liberty Tana Lawn, both high-quality materials. If you love your bunny, you can purchase additional patterns to make pants, a shirt, a knitted sweater, and a hooded coat. This kit is $34 + shipping. Get it here. 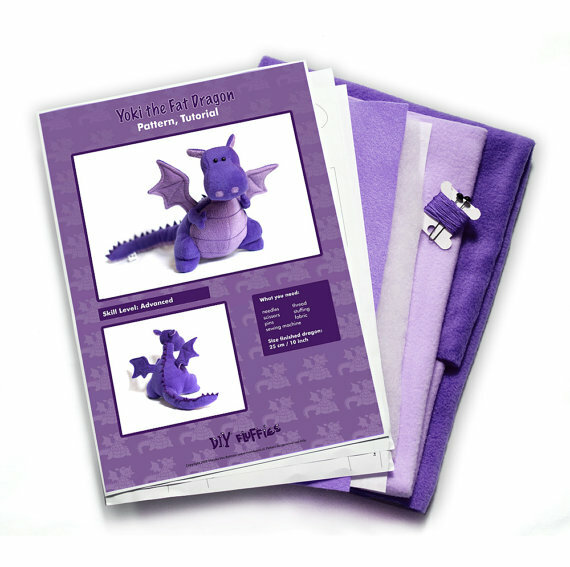 Next we have an adorable kit from DIY Fluffies, Yoki the Dragon. This kit comes with fleece in two colors, felt, glass eyes, batting, embroidery floss, and a detailed paper pattern. I’m showing it here in purple, but it’s also available in green, blue, and pink and Mariska has lots of other animals as kits, too. I’ve admired DIY Flufflies softie patterns for years and I love the design of this dragon. I’ve seen several of them sewn by Mariska’s customers and they look terrific. 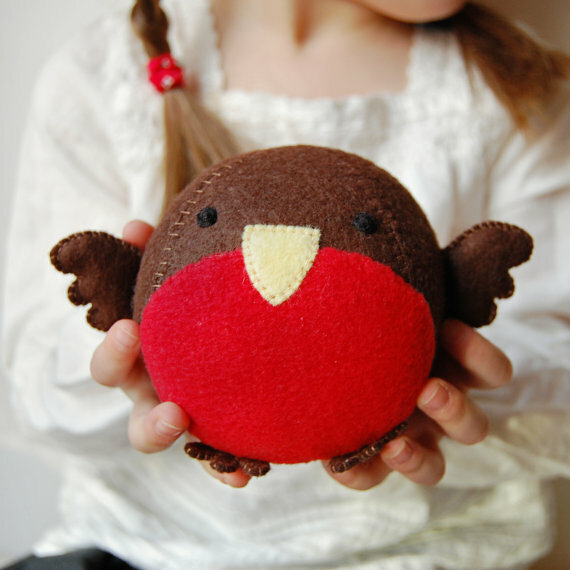 If you’d like to try sewing a softie from fleece, this would be an awesome project! The finished dragon is 10″ tall. This kit is $24 + shipping from the Netherlands. The pattern is also available in Dutch and German. Get it here. 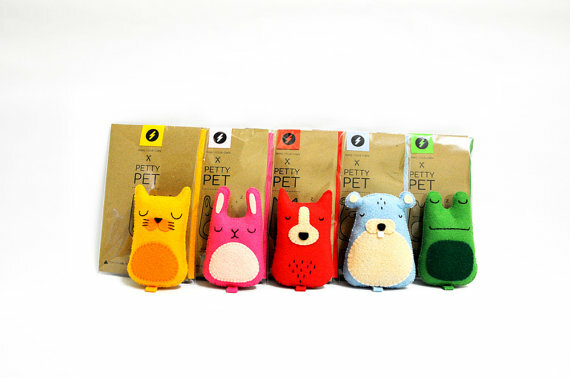 Make Your Own Petty Pet is a set of kits by new-to-me shop on Etsy, Pupurin. There is a kit for each of the critters you see here and each kit comes with a pattern, instructions, felt, a needle, thread and stuffing. The finished toy is 11 cm tall and comes in super cute brown paper packaging. 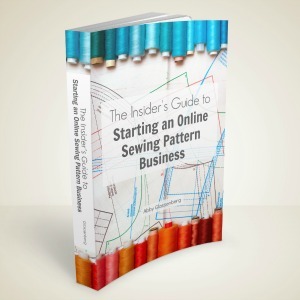 This looks like a great kit for a beginner sewist and would be a fun birthday gift for a child. It’s $8 plush shipping from Malaysia. Get it here. Why stop at just one kit? Join a kit club and get a treat on a regular basis! My friend and fellow softie designer, Wendi Gratz of Shiny Happy World, has a terrific kit club going on right now. It’s called the Cuddle Club because each kit includes super soft cuddle from Shannon Fabrics along with a pattern, instructions, notions you’ll need like safety eyes or embroidery floss, plus an extra little gift! 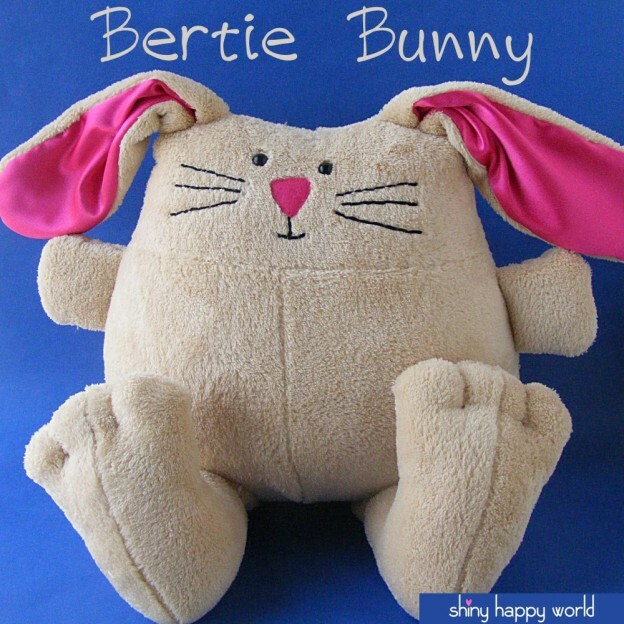 This pattern for Bertie the Bunny was the first in the cuddle club. I love this huggable guy! Each shipment is $19.95 plus shipping. Join right here. Next up is this Make Your Own Robin Kit by Clara and Macy on Etsy. This is one in a series of “fattie” softie kits that also includes a lion, chick, rabbit, kitty, pig, bluebird, and sparrow. I really like how big the finished toy is – it’s not just a tiny thing. You could really pelt it at your sister if you wanted to (but you wouldn’t do that, would you?). The kit is packaged in a recycled brown box and includes wool felt, fleece, thread wound on tiny wooden spools, embroidery floss, stuffing, a needle, pattern, and instructions. All you need is a pair of scissors. The Make Your Own Robbin Kit is $30.80 plus shipping from the UK. Get it here. 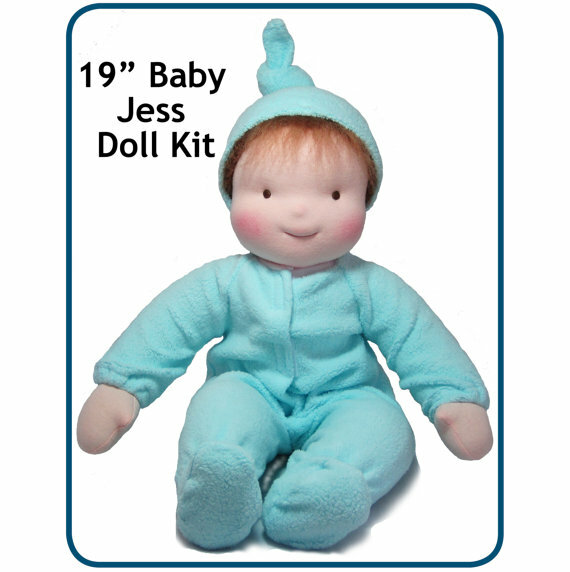 And finally, a kit for a Waldorf doll: the Baby Jess Kit. I’ve always wanted to make a Waldorf doll and try my hand at needle-sculpting the face. I’m most excited about this kit because it includes the special cotton doll skin and something called “inner head tubing” that I want to experiment with. 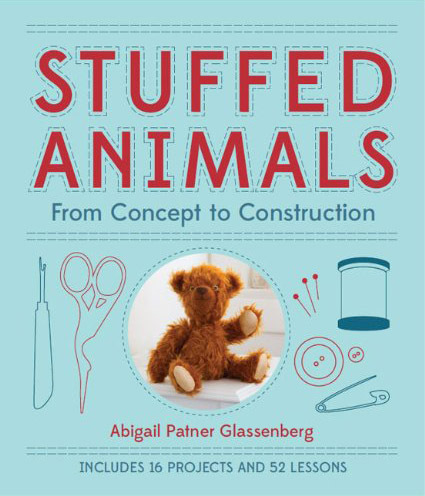 It also has yarn hair, wool stuffing, craft string for tying the head, a stuffing stick, and a pattern. It sounds to me like you’d learn some great skills and get some tools you could reuse. And this doll can wear newborn clothes! It weighs 3.5 lbs. The Baby Jess kit is $62.99 plus shipping from Canada. Get it here. I was inspired to put together this post after reading Ann Martin’s wonderful round-up of paper crafting kits on her blog, All Things Paper. If you like kits, check out Ann’s post, too! Have you tried any of these? Do you have any other kits to recommend? lots of variety. Have you ever thought about selling kits Abby? Kits require lots of things like bags and packaging, printed patterns, and bolts of fabric, that I’m not sure I want to delve into right now. But I love seeing all the creative kits other makers are offering! I love kits as they are a great way to dive into a craft. Having all the materials and instructions supplied makes trying something new seem a little less scary somehow. I think if you started doing kits they would likely be very cool and very popular, but I get what you mean about the extra considerations. You need capital for supplies and space for stock, as well as extra time to put everything together. I have several of DIY Fluffles patterns and they are all incredibly cute and well worth the cost! My first attempt at making Yoki failed miserably (I accidentally sewed his ears to the bottom of his feet b/c I didn’t organize my pieces properly!) but the end result was adorable if a bit screwed up. 🙂 My husband loves his “Franken-Thumpy” (as the misfit toy is now dubbed), and uses him as commentary in his you-tube videos. (He plays electric piano, and Thumpy gives tips and tricks along the way). I now have friends requesting more of the dragons, and I’m making another penguin for my baby niece whom I’ll be visiting next week!